Durian: The King of Fruits! Durian, the king of fruits. The Mother of all fruits in the entire world! To earn this coveted title, the durian must be something very special. 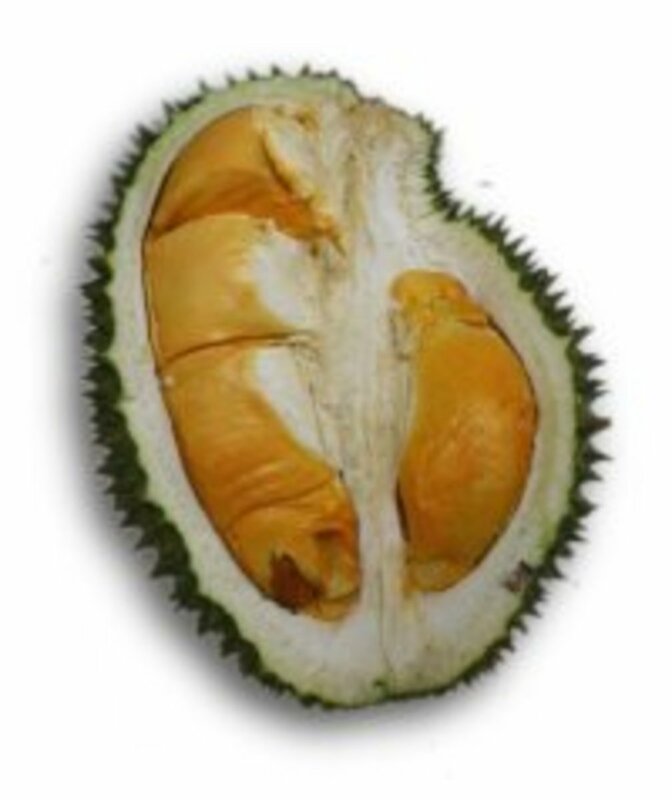 From the shape of the durian fruit to the taste of the durian flesh, it is beyond verbal description. But since this is a written article, a brief description of the durian fruit should be given. The fruit is thorny. That's why it's called "durian", meaning "thorny" in the Malay language. The shape of the durian is irregular. The average size of the durian is about that of a coconut. The durian fruit can be described as formidable and awesome. The binomial (scientific) name for durian is Durio Zibethinus Linn. 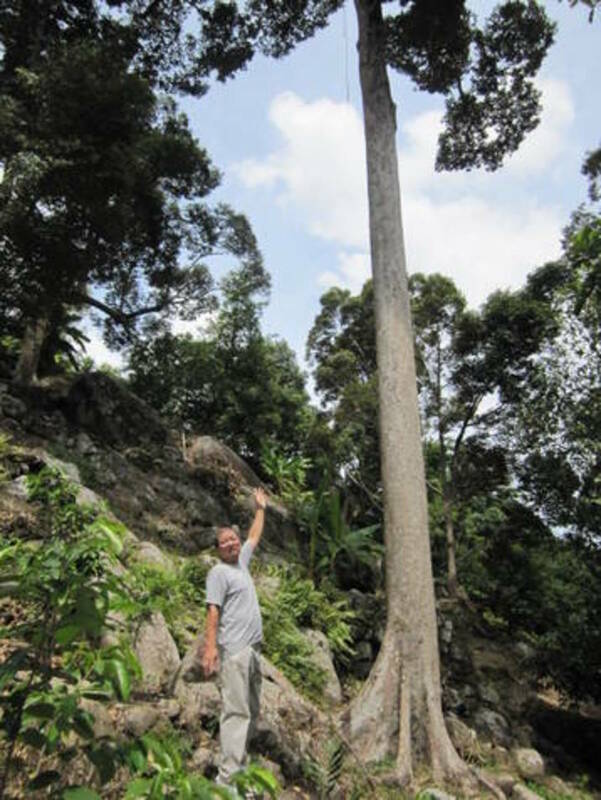 The height of the durian trees ranges from 25m (80ft) to 50m (160ft). 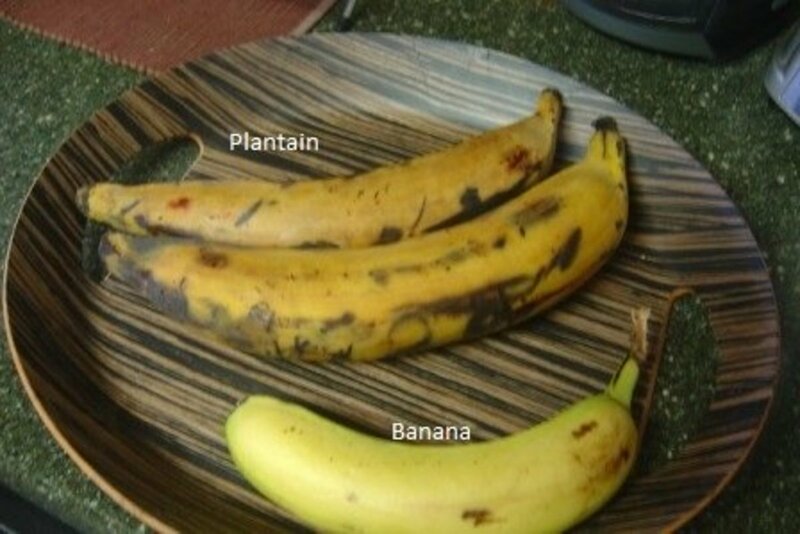 The fruit size averages 25cm (10ins) long and 15cm (6ins) in diameter, weighing from 1 kg (2 lb) to 3kg (6 lb). Bats and honeybees are the main pollinators for the durian flowers. It is in season from April to July. 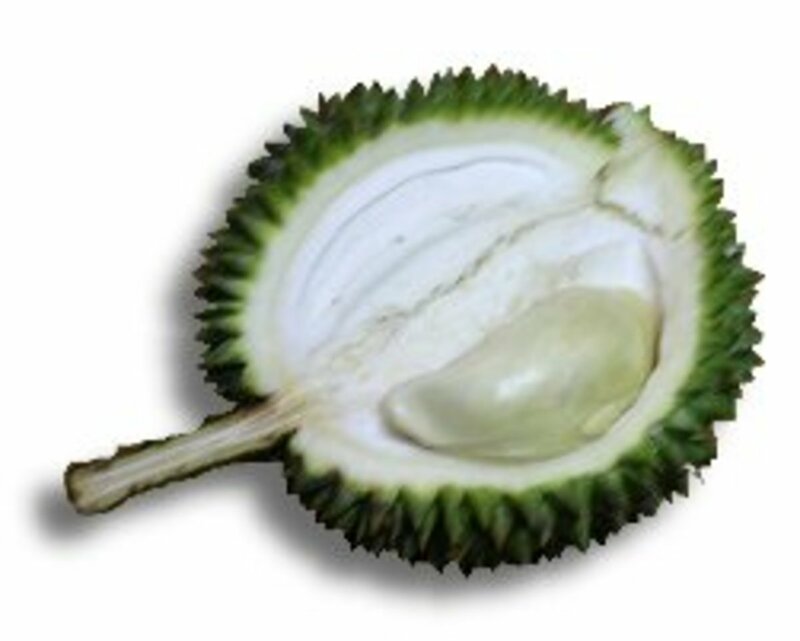 The durians come in all shapes and sizes, with different types of thorns as well. And the flesh…well, you got to see it with your own eyes to appreciate the large varieties. What about the smell and taste? We shall talk about them later. In Malaysia, durians are allowed to drop by themselves, usually in the early morning. They are then at their peak in ripeness and taste. Then they are best eaten within the day. The Malaysian durians can be said to be the best in the world. 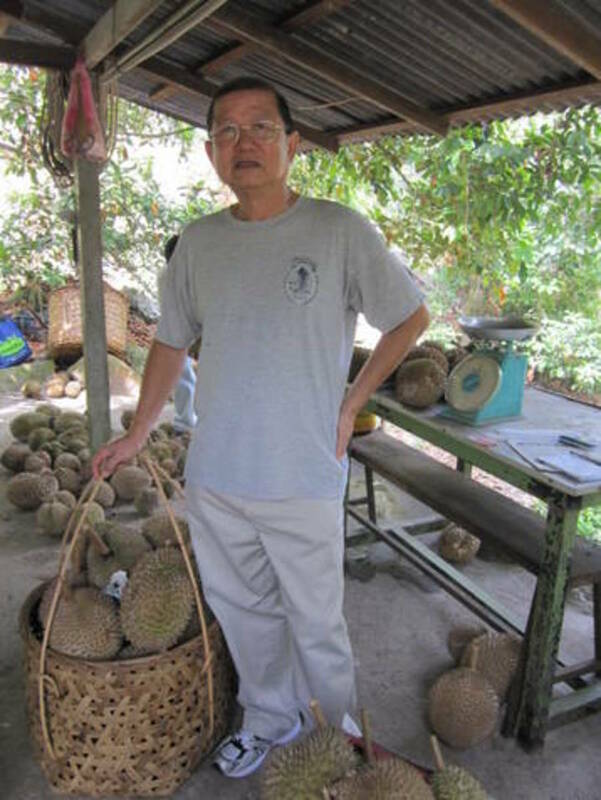 And the best location in Malaysia to find the best hybrid durians is on the Island of Penang. More on this later. What about the flesh? Let’s separate this question into two parts. First is the smell. Then comes the test, or rather the taste. For those of you who have never smelt a durian in your entire life, don’t attempt to imagine its smell, lest its taste. You will never get it right. Some tried to scare the daylight out of you, and compared the smell with rotten rat. I wonder whether they had ever smelt a rotten rat. Then what about the taste? This is a big problem. I suppose if you believed their description, then you need to taste the rotten rat!! I think you are cheesed off by now. By the way, some said the durian tasted like rotten cheese. The only way to know the smell and the taste is to smell and taste it! No other way. So I shall not describe and deceive you. 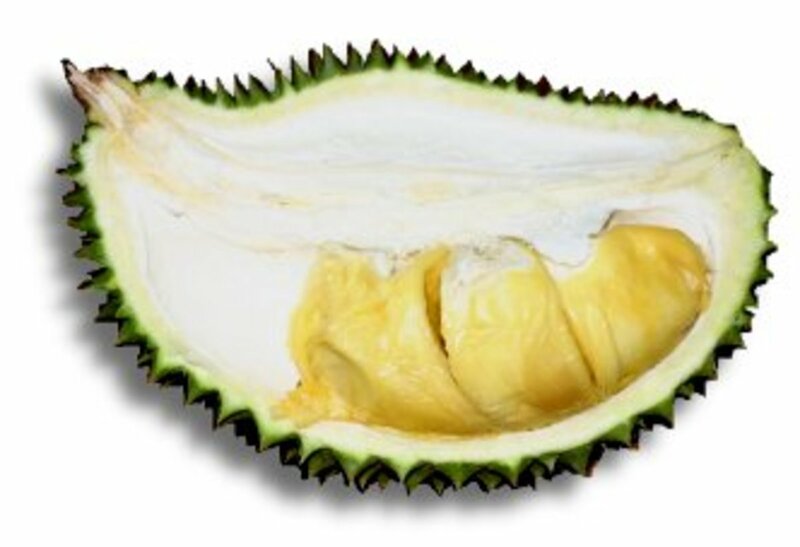 To the connoisseur of durians, they smell exotically aromatic, and taste uniquely exquisite. What does this statement convey? Nothing except some verbose explicits. 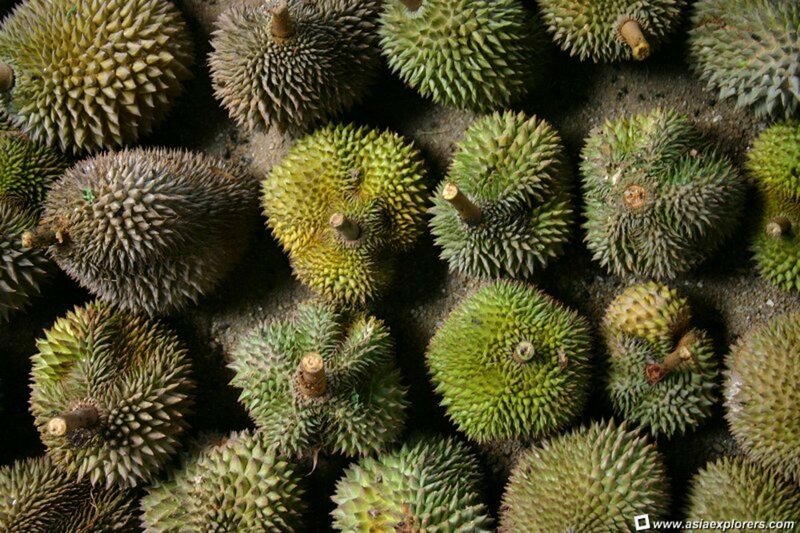 To stretch it further, to the uninitiated, the durians stink like disgusting body odor and taste like rotten eggs! Which category do you belong to? Smell and taste the durian, and you will immediately know the answer. Whatever; I am writing this article based on my personal experience with this king of fruits. Where else can you find the perfect durian with the perfect texture, the perfect smell and the perfect taste? Ask anyone who is familiar with the durian, and he or she will tell you the best durians come from the island of Penang, Malaysia. Penang, my hometown, the haven of hybrid durians! This is one claim that I am extremely proud of. 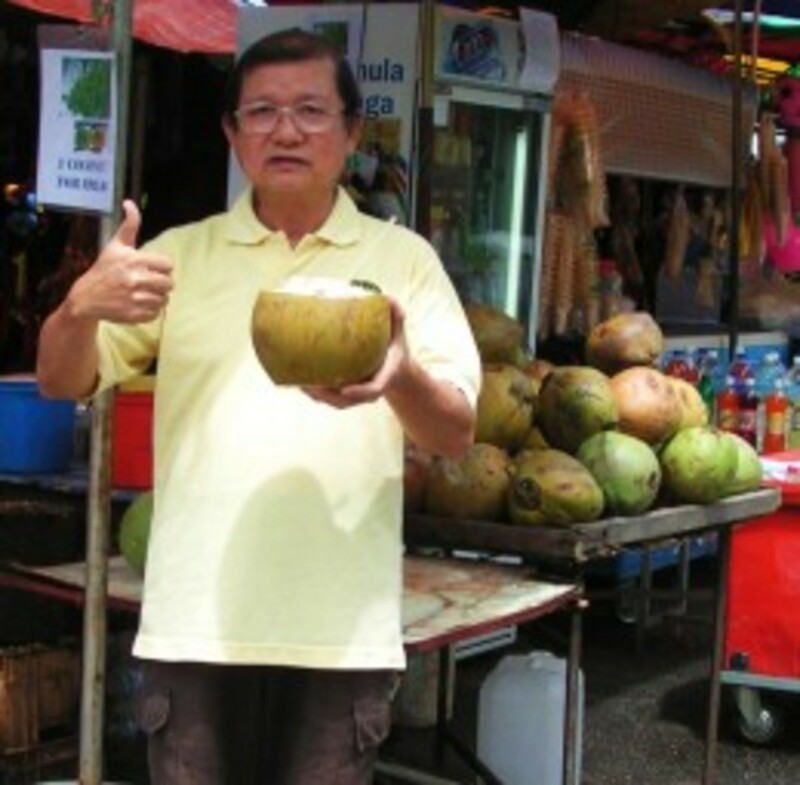 By the way, Penang is a holiday paradise, and is packed with many other specialties as well. No wonder it’s revered as “The Pearl Of The Orient”. 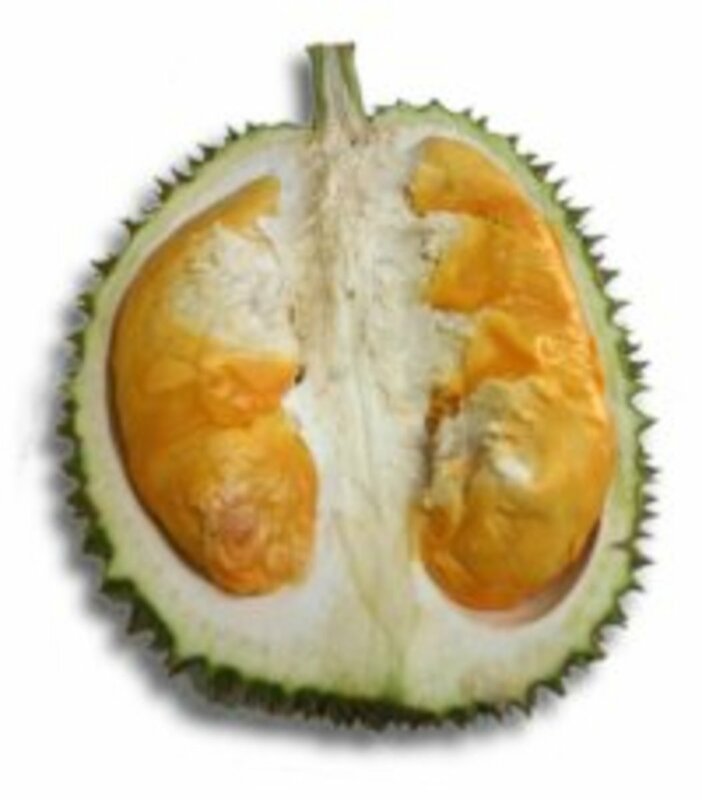 Durians are rich in energy, minerals and vitamins. Sugars like fructose and sucrose give energy to the body. 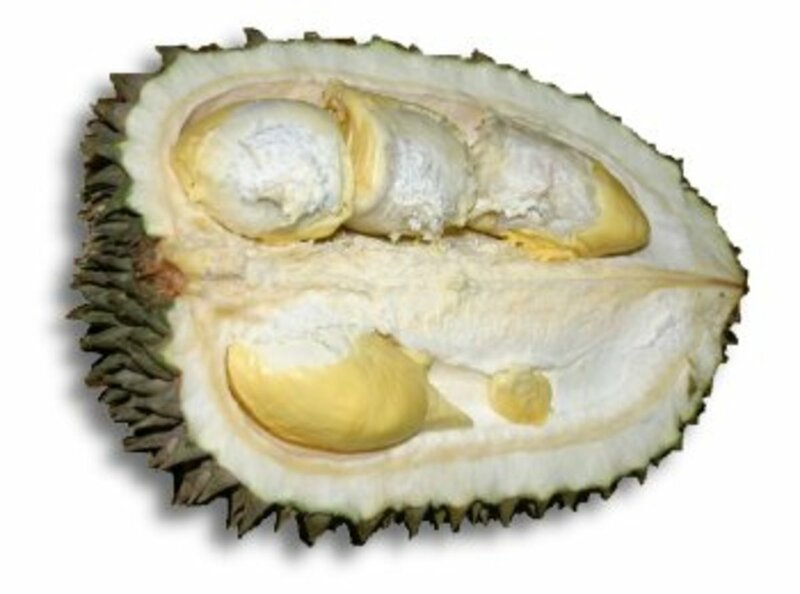 Although the durians have high amount of fats, they are free of cholesterol. They are rich in dietary fiber, with good source of B-complex groups of vitamins which the body cannot produce. Main minerals present are manganese, copper, iron, magnesium and potassium. And of course vitamin C is a plenty in the durians. 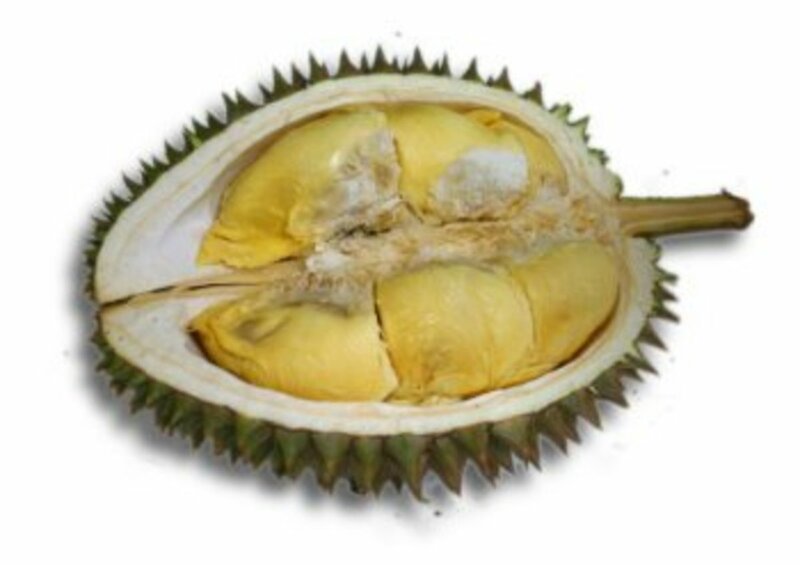 In Chinese terminology, the durian is a “heaty” fruit and have warming properties. The body experiences warmness and the throat becomes dry, after eating durians. That is why we always drink a glass of salt solution after a durian feast. This brings us to another tropical fruit which is an essential complementary fruit after eating durians. 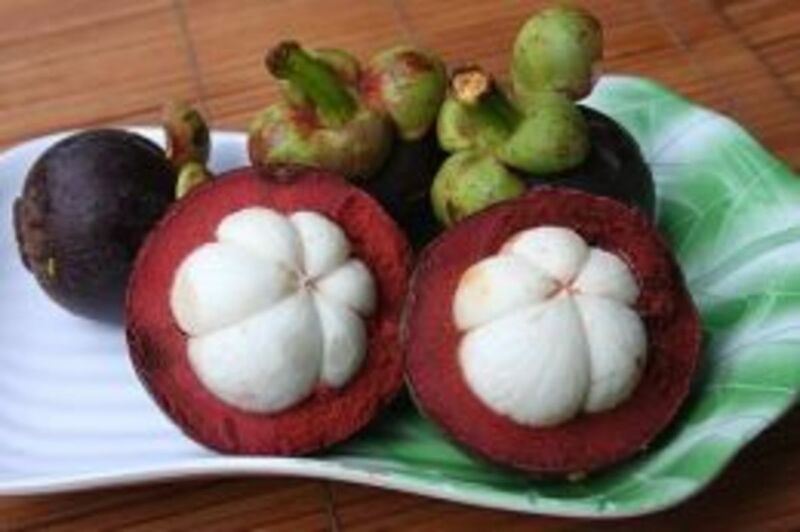 The mangosteen has cooling properties and acts as a counter-agent after eating the durians. A proper durian feast is therefore not complete without the culminating sweet and juicy mangosteen indulgence. That is why the mangosteen is considered the Queen of fruits. These people are the goners. To taste it will be worse than being pricked by the durian thorns. It would be good to use the durian flesh to torture them! My secret wish is that they stay that way. More to share! Aah! These are the ignorance who have gained enlightenment! Having tasted the forbidden fruit, they are hooked for life. The durian is such a unique fruit that even the flesh has so much variations. The shape, texture and color of the flesh varies with different varieties. For the uninitiated, even the shape of the flesh will surely put you off. Look at the shape of the flesh, and let your imagination lead you to the toilet….get what I mean? Ok, generally the color of the flesh ranges from white to bright yellow and light orange. The texture of the flesh is usually creamy. 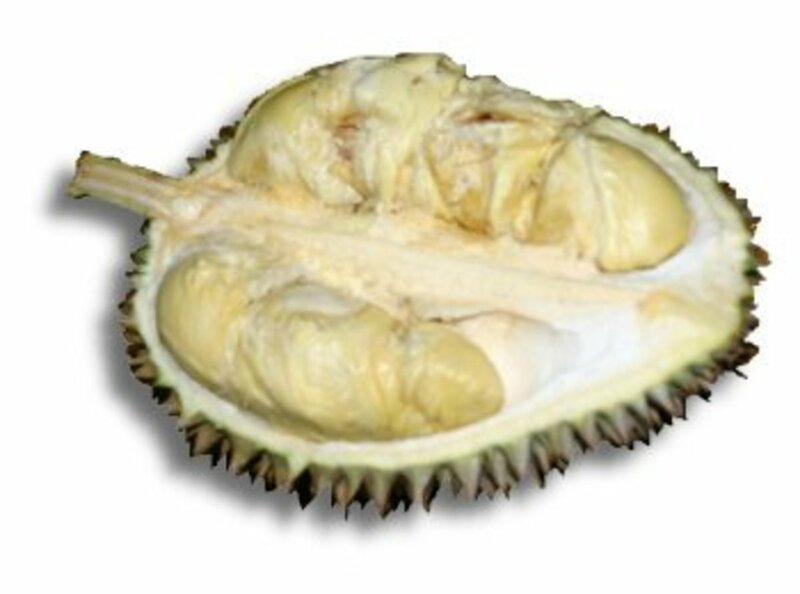 You can find durians everywhere in South-east Asia, namely Indonesia, Thailand, Indo-China, Burma, Philippines, and of course Malaysia, in particular Penang Island. 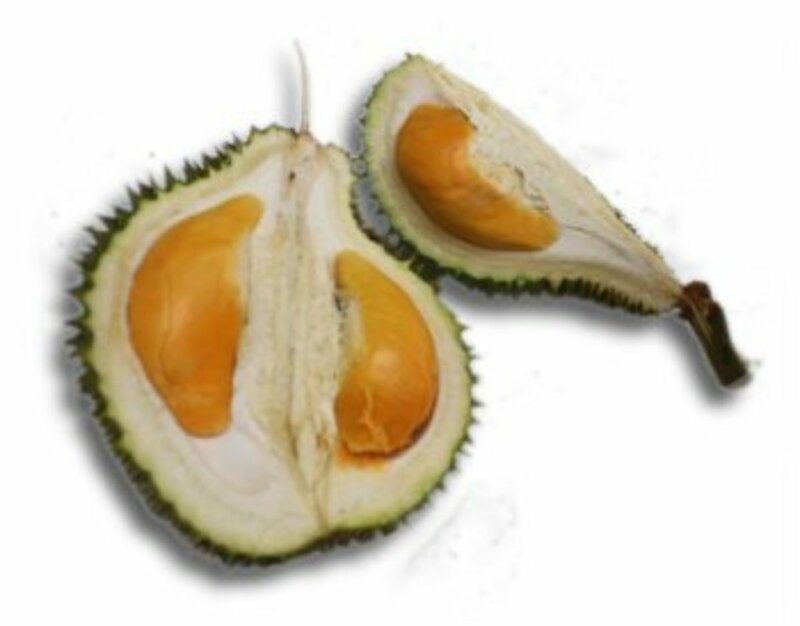 Durians from Penang Island have more aromatic taste. I don’t think I can do any justice to further describe it. So just leave it at that. The challenge is to taste the Penang durians and then compare them with the rest of the world. The result is beyond doubt. 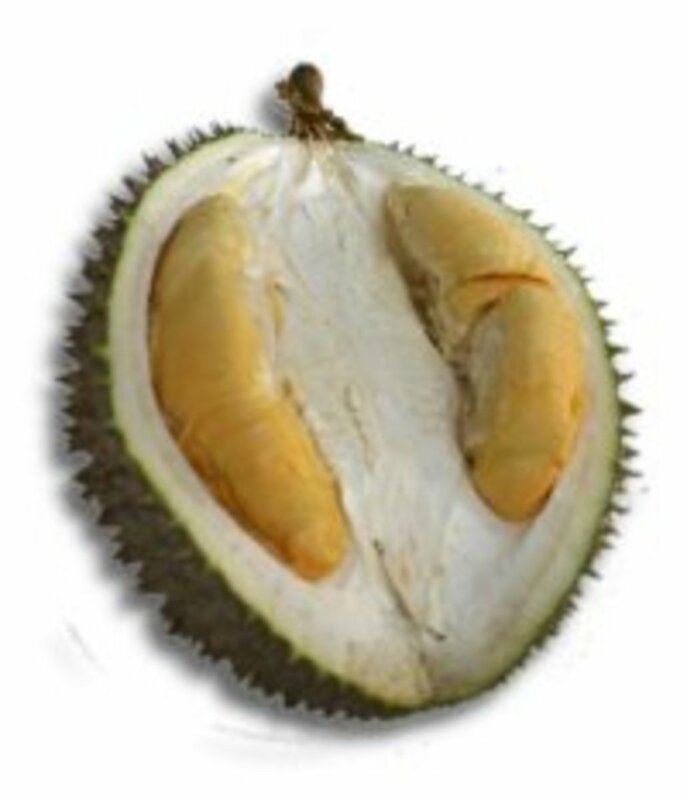 Apart from this fact, Penang Island have special hybrid durians with exquisite shape, smell, texture and of course, taste. The names given to these hybrids are in local Penang Hokkien dialect. 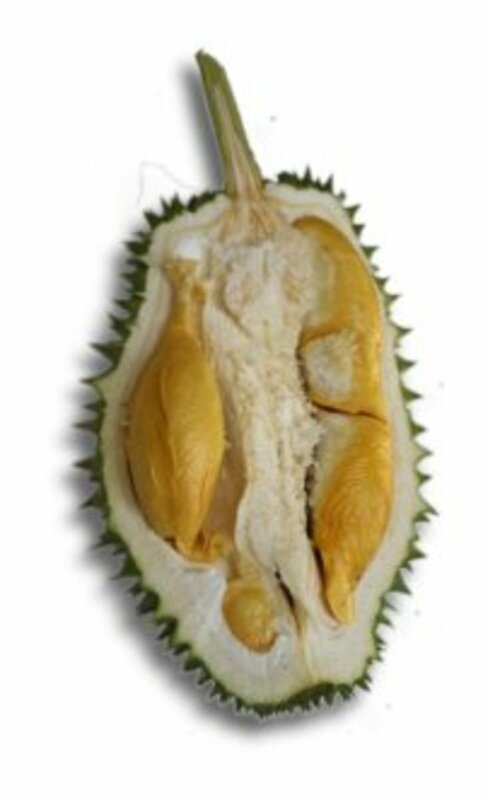 This further gives credence and exclusiveness for Penang Island hybrid durians. 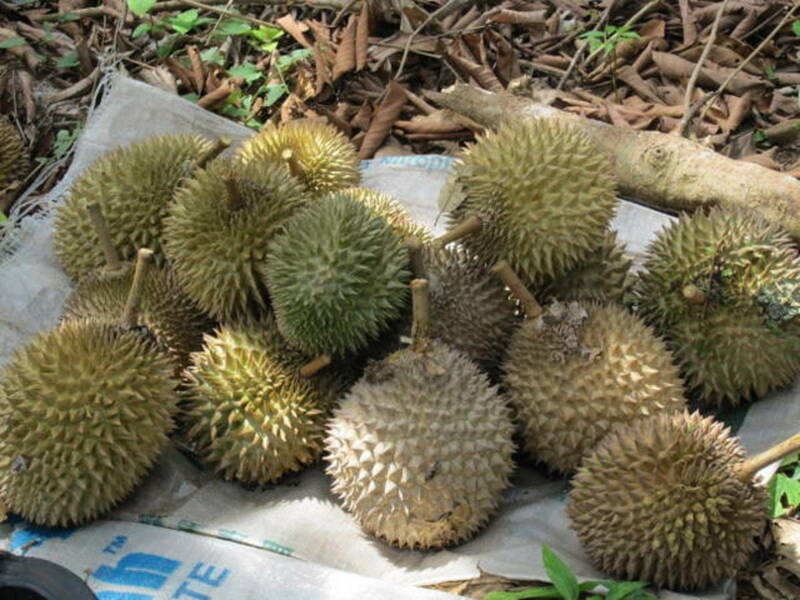 Below are the main hybrid durians. I can’t even claim to have the opportunity to have tasted all of them. They are of course very pricey befitting their kingly status. 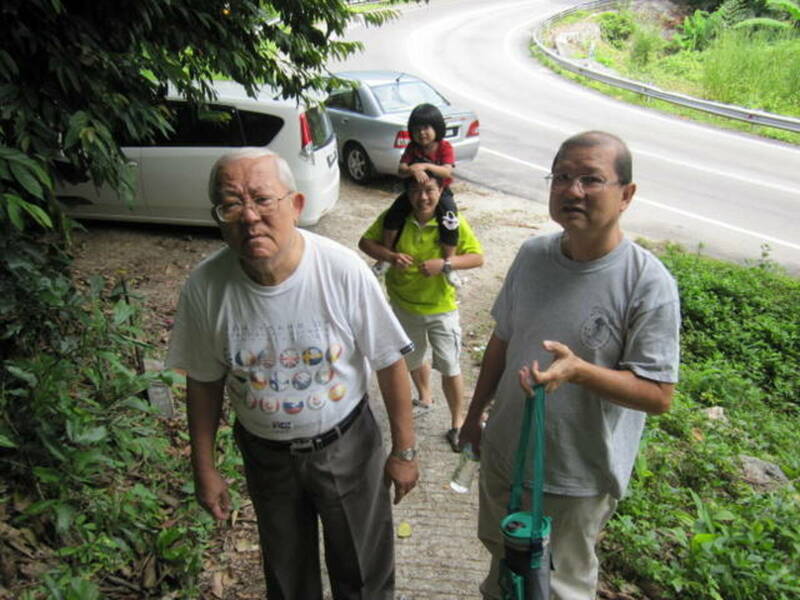 The names are in Penang Hokkien dialect, with English translations. Equivalent Malay names are also given to them. The alphabet "D" is of course for the word "Durian". Please note that taste description is just of personal opinion and especially for durians, mere description cannot do any justice to the real thing. Quite honestly, I personally don't think that it is possible to effectively describe the taste of each durian variety. As the saying goes; the proof of the durian is in the eating. 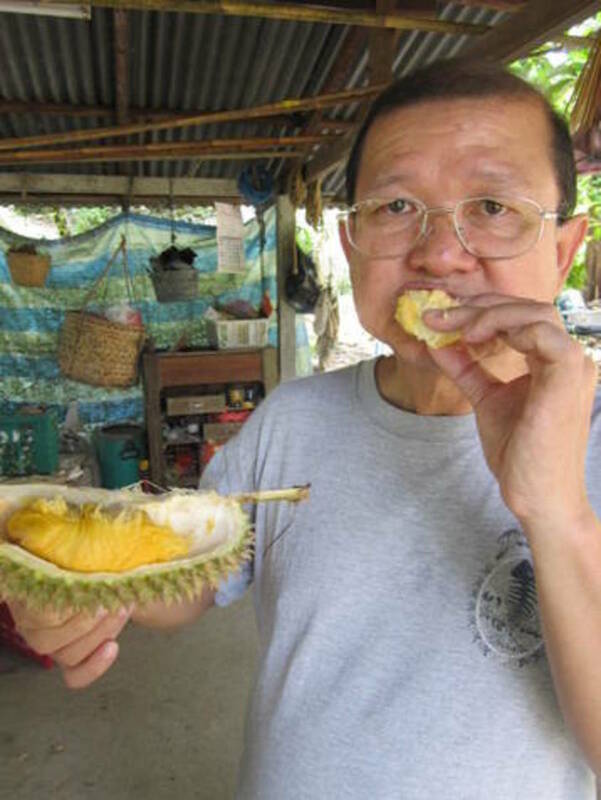 And my own quotation, "The taste of durians is in the tongue of the beholder!" 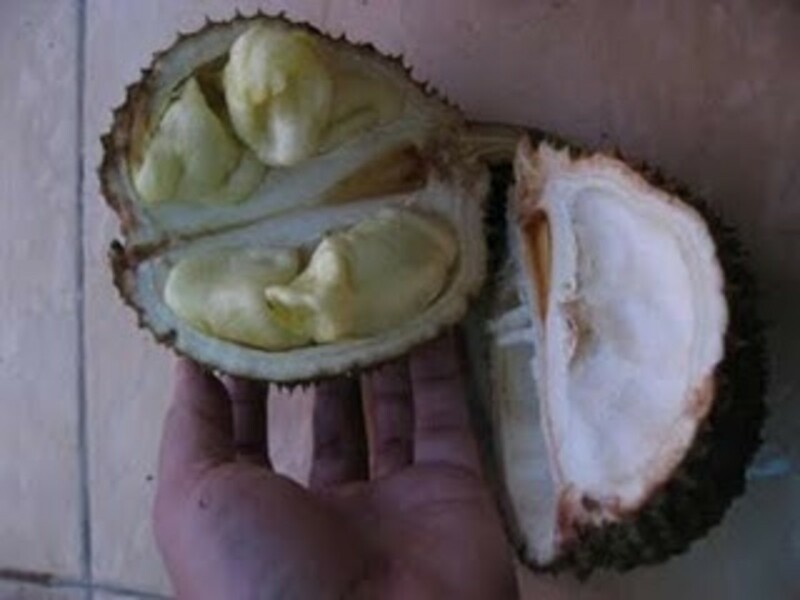 The description and the photos of the hybrid durians were taken from and with the kind permission of the web-master of "Asiaexplorers.com". 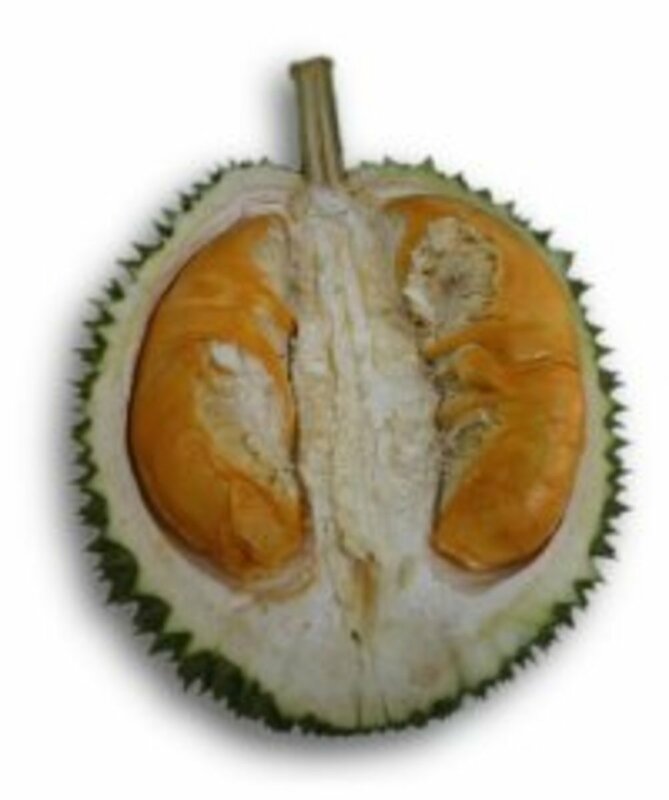 This was a very popular durian in the 70's. It has creamy yellow flesh with a pleasant taste and a subtle smell. The flesh is quite sweet, and has some 'body' to it as the seed is small. The flesh is creamy and has a bittersweet taste to it, with a touch of sourness. Flesh which is quite soft and very sweet, and dark yellow in colour. It also has a nice aroma. 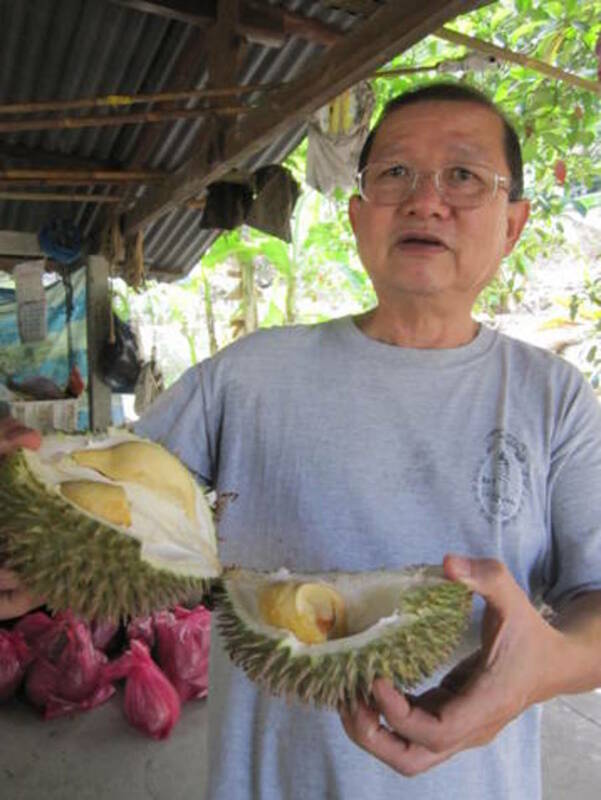 This durian takes the name of the late Mr Lau Khun Poh, who first budded it. Khun Poh has beautiful orangey flesh with a slightly bitter-sweet taste and a heavy aroma. The flesh of the Hor Lor is very soft, dry and quite bitter. It has a sharp smell to it. It got its name from its appearance resembling a 'Hor Lor' pumpkin or water gourd. Ang Heh has a round shape and short thorns. The thick orange reddish flesh is highly aromatic, very soft with a bitter-sweet and creamy taste. The flesh is whitish, the taste is superb, milky, like very sweet, melting chocolate. The name 'yah kang' means centipede, and accounts for the number of centipedes found at the foot of the tree, hence giving it the rather unusual name. Bak Eu has a slightly acidic aroma. The flesh is whitish like lard or pork fat, hence the name. The taste is quite bitter but nice. D17 has dark creamy flesh. The taste is slightly dry but sweet. This durian gets its unusual name because it looks like two durians joined together, one big and one small. 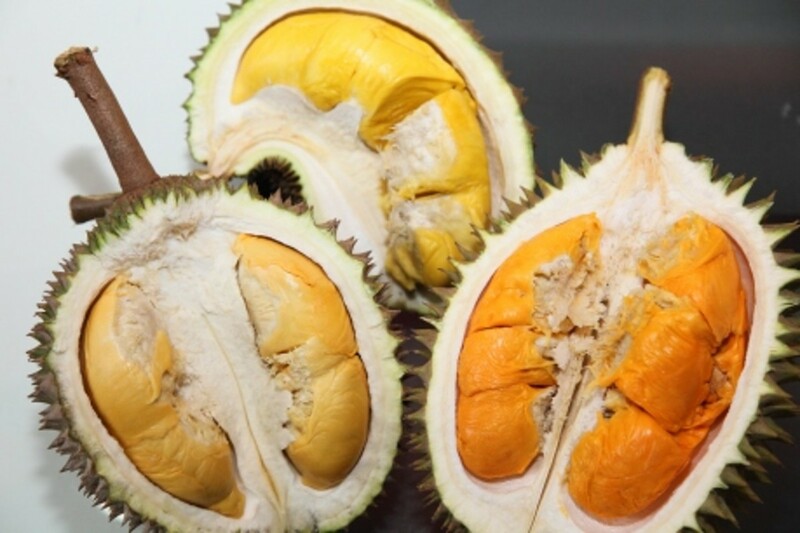 When split open, you almost thought the two halves belong to two different durians. Coupling has whitish flesh which is slightly dry but tastes good. 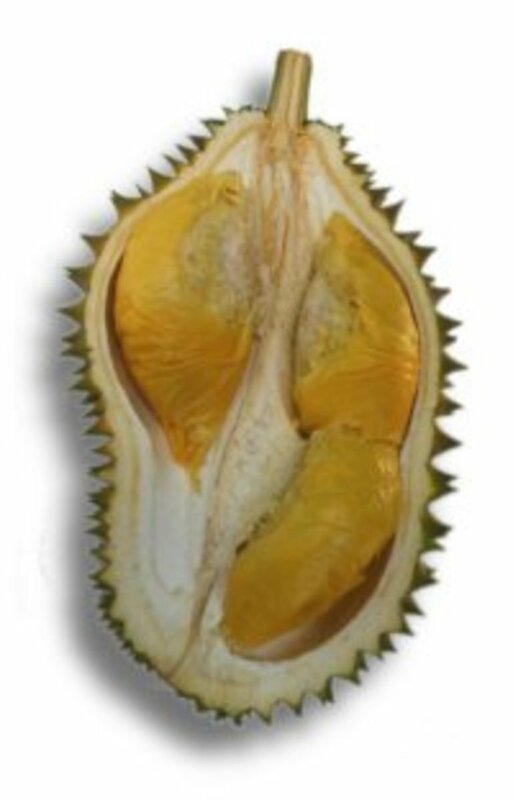 As the name suggests, Ang Jin Durian has deep orange flesh, big and thick. 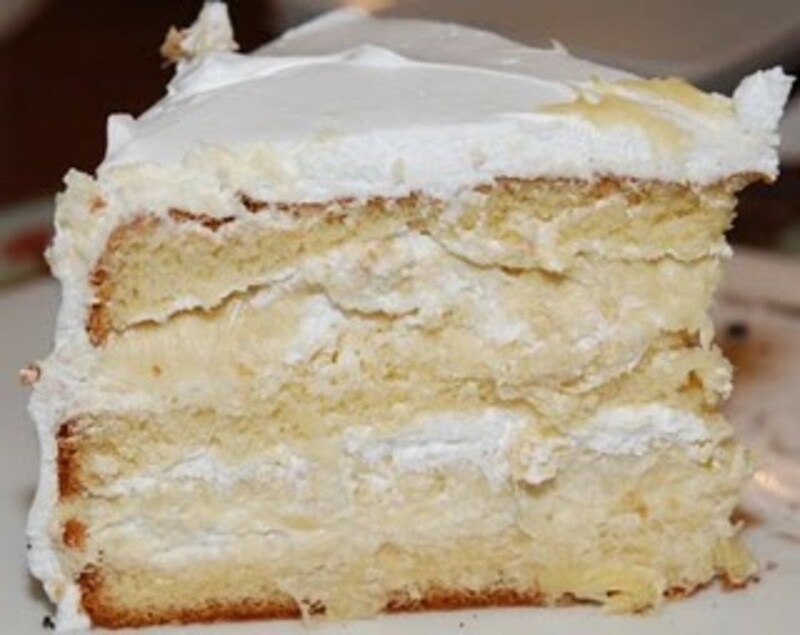 It is very sweet and creamy. This durian is named after Lin Fong Jiau, aka Mrs Jackie Chan. It is indicative of the relationship of the celebrity couple, for Lin Fong Jiau is a bittersweet lady. Creamy taste and of fine texture. Usually long oval shape and golden in colour with short and sharp thorns. Medium-sized with long oval shape. Solid yellow flesh, sweet and creamy. Flesh is soft and reddish. Sweet and creamy in taste. Has long thorns. Flesh is rich and sweet. In addition there are also the D2, D24, D99, D101, D123, D145, D146, D158, D159, D169, D500, Kim Hoo (Gold Fish), Ang Hua (Red Flower), and Chap Sa (Thirteen), Chap It (Eleven), Tau kua (bean curd), Tiger Hill, Kanna (Olive), amongst many others. And announcing the king of kings, the mother of all kings of durians: the No. 1. Best. The Raja Kunyit, Malay for "King Tumeric". This time the name is strangely in Cantonese called "Mao San Wong" ( 猫山王 ) literally "Cat mountain king" or more correctly "Mountain King Cat". Tumeric comes from the colour of the flesh which is golden yellow. It has short and sharp thorns. 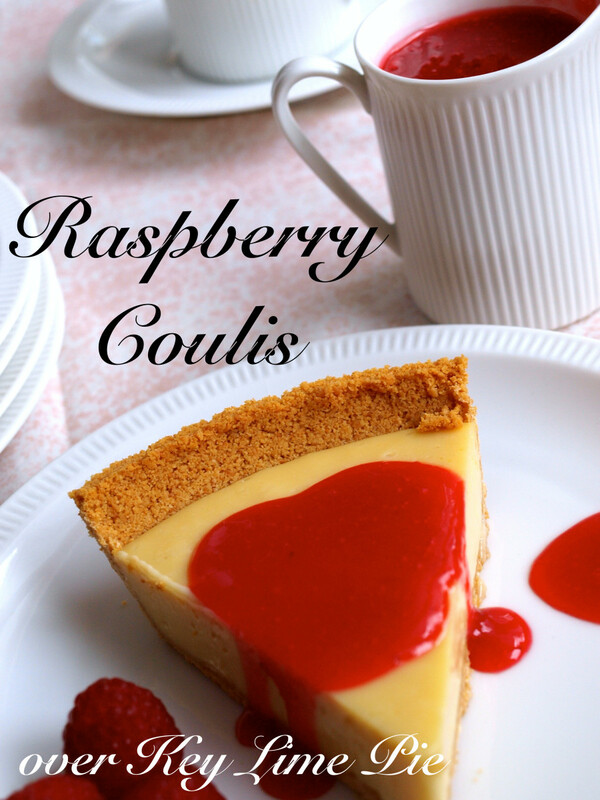 It is super sweet, creamy, and has the most fragrant taste. 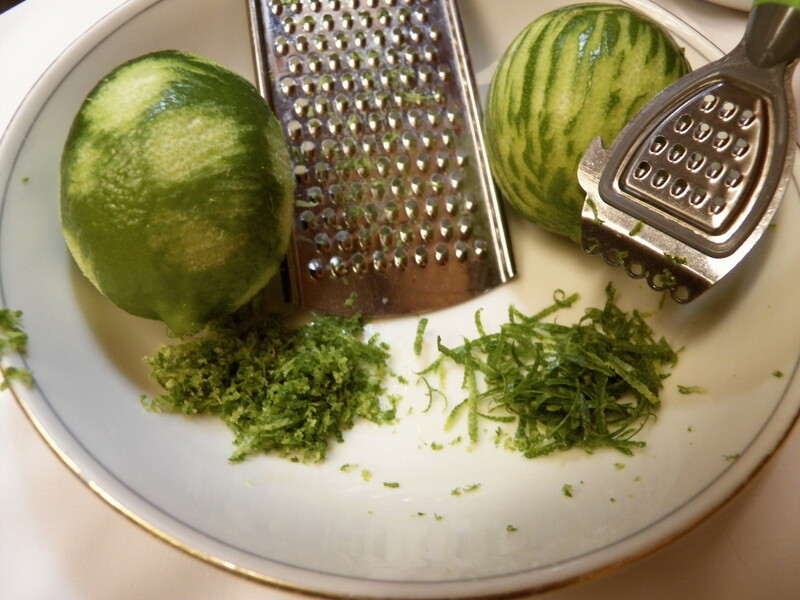 The pulp is very thick and the seeds are very small. This is the best durian in the whole world! I think I should give it a more befitting name in Cantonese "Mou Tak Teng" or in Penang Hokkien "Bo T'an Pi" meaning "no comparison." 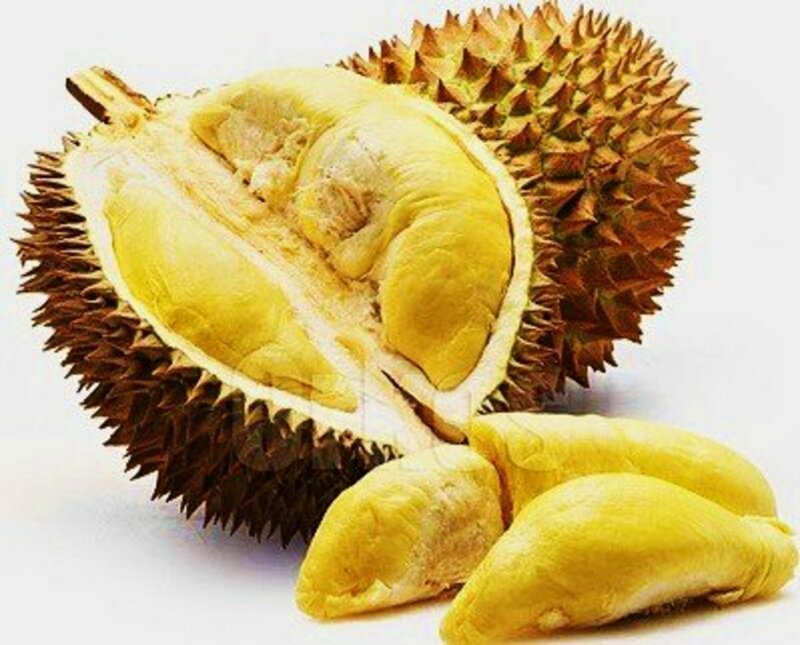 Now we come to the most unusaul durian, the red durian! Unbelievable but true. This variety is found wild in the jungles of Sabah, an eastern state of Malaysia in northern Borneo. The flesh is drier and taste a little sourish, and not as aromatic as the normal durian. Just when you think that's all to the durians, there is yet another surprise. 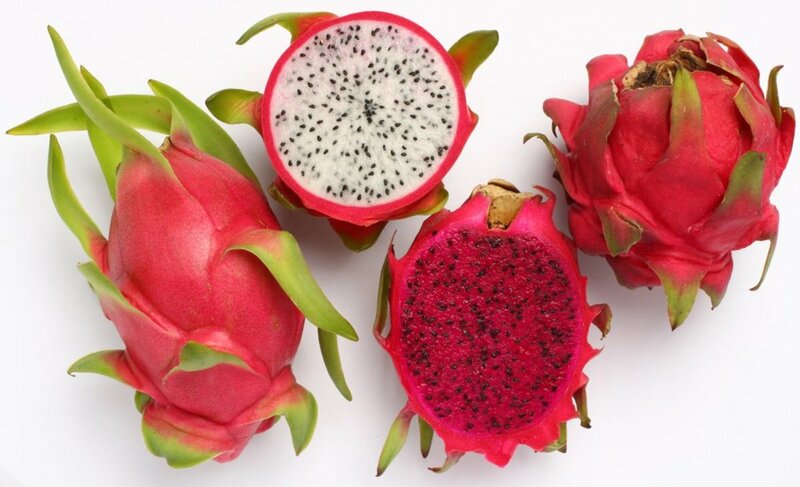 The king of all fruits must be most unique and must be able to stand aloft from the hundreds of other fruits. No other fruit can come close to the mighty king in terms of shape, size, weight, color, smell, texture, and of course taste. And not to be oudone in anything, there are durians that attach on the base of the trunk. That goes for easy picking. It is so unique. 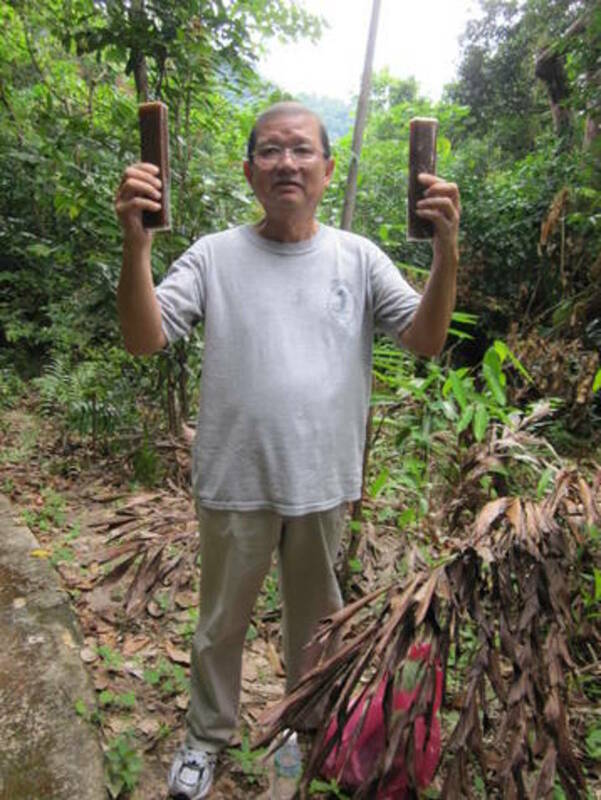 The Kurakura durians are found wild in Borneo. "Kurakura" is Malay for "tortoise". The fruit is pale yellow, and the flesh is yellow. The taste is not that good and is very overwhelming. 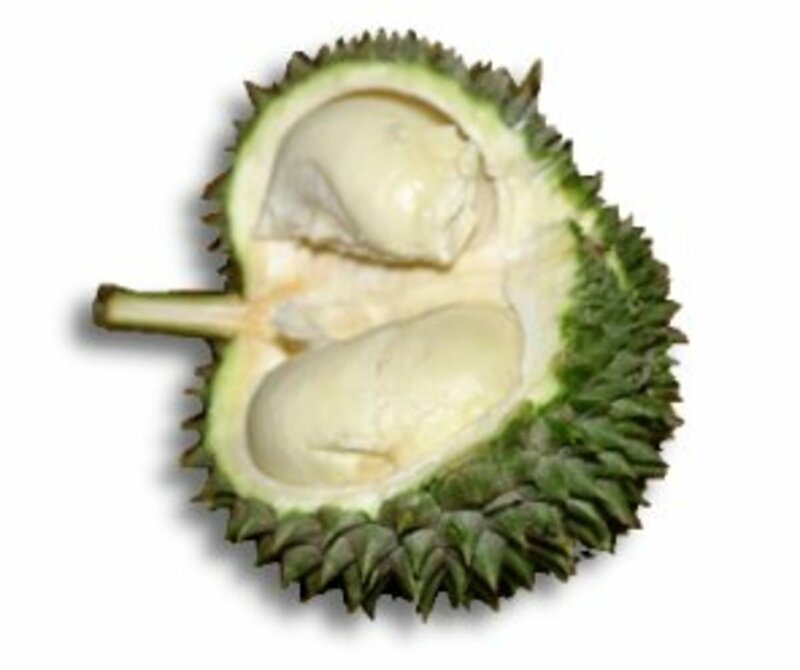 Good durians are consumed fresh, on the same day they are picked. 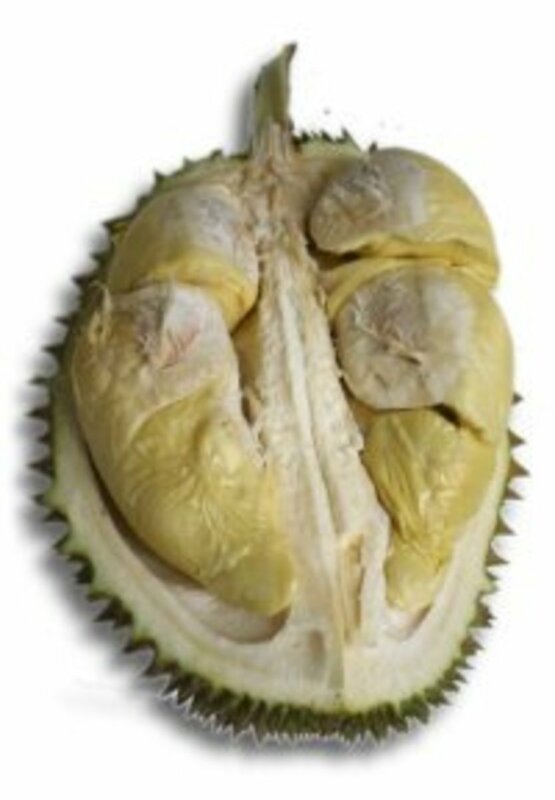 Overnight durians lose their texture and the flesh becomes softer and the taste becomes milder and less penetrating. But those leftover durians are not gone to waste, even the rejected poor quality ones. They are made into sweets, pastries, candies, cookies, cakes and durian ice cream too. Nowadays, even mooncakes are available with durian fillings. There are two types of durian cakes. The conventional authentic durian cake (dodol), and the Western varieties. Take a look at the pictures above and below. 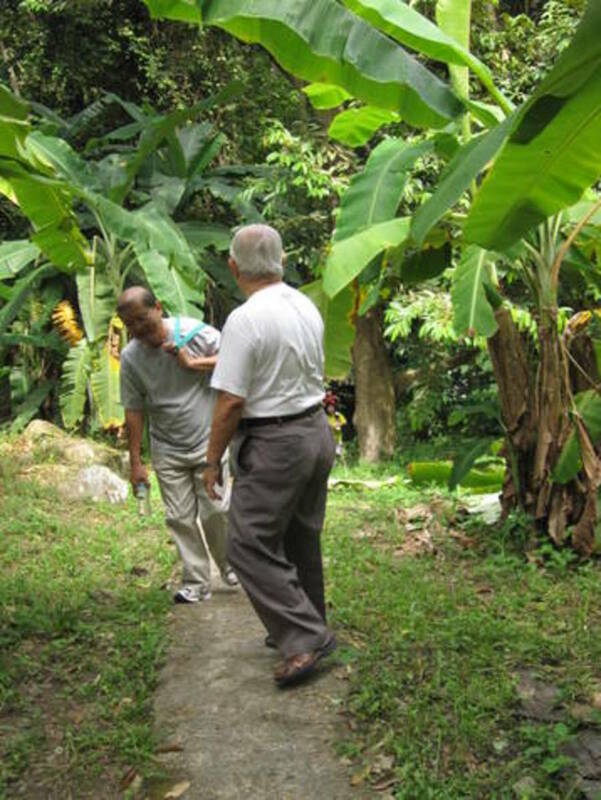 May I invite you for a tour of a durian farm with the one who knows best, that's me! 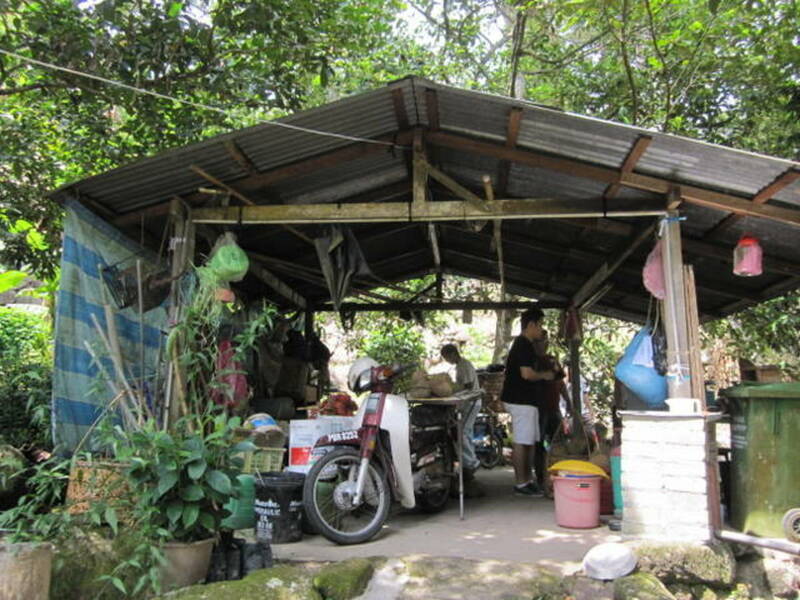 The photos you see below were taken on a sunny Saturday, 7 July 2012, when I visited a well-hidden durian farm. So let's keep this place a secret, lest I would not have enough of the best of durians in time to come. Of course this farm is in the well-known durian zone of Balik Pulau on Penang Island, the area which grows the best of durians in the whole world. The photo below showed me enjoying the ultimate fruit of heaven, the king of all fruits! This particular one is called "Tiger Hill". Even the name itself sends shivers down your spine. You never know where you would end up in Tiger Hill; most probably in the tiger's mouth. For this particular adventure, the Tiger Hill was conquered by me through my mouth. Yummy! Sorry I cannot find any appropriate word to describe the feeling and the taste. The only way to know is to taste i!! For now, just use your own imagination! Durians are very fleshy but not juicy at all. After a good feast of durians, you would feel dryness in your mouth and warmth in your whole body. The "tradition" is to eat mangosteen and drink coconut water to neutralize the dry and warm effects on your body. Yes, the metal durian of Singapore. 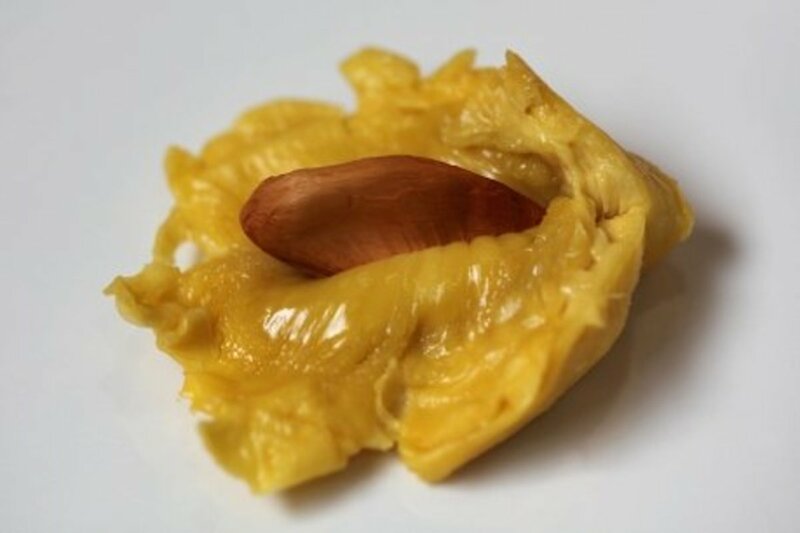 Of course, you can't eat this metal durian. 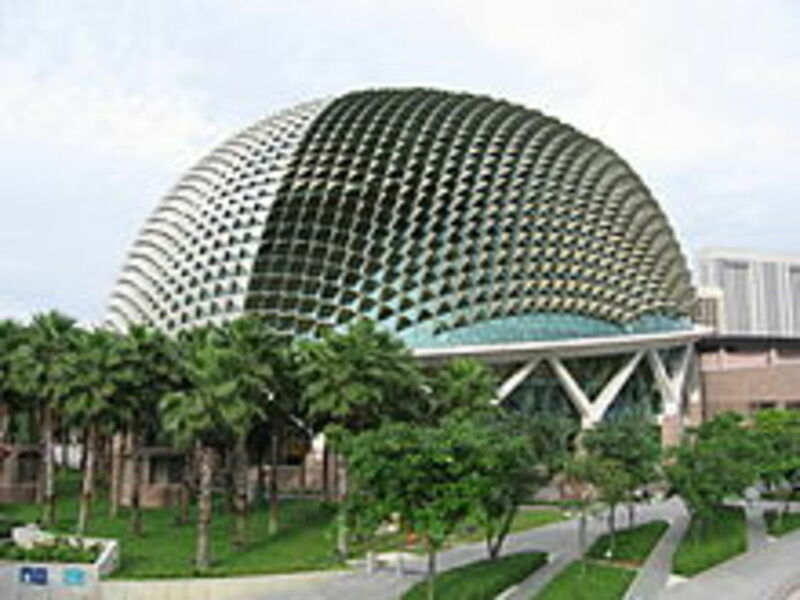 The Esplanade is a waterside structure with the aluminium sunshades shaped like a durian. The Esplanade houses a concert hall, a theatre and a library, together with retail and food mall, and lots of open space for recreation. Take a look at the photo on the right. Believe it or not, wine made from durian? 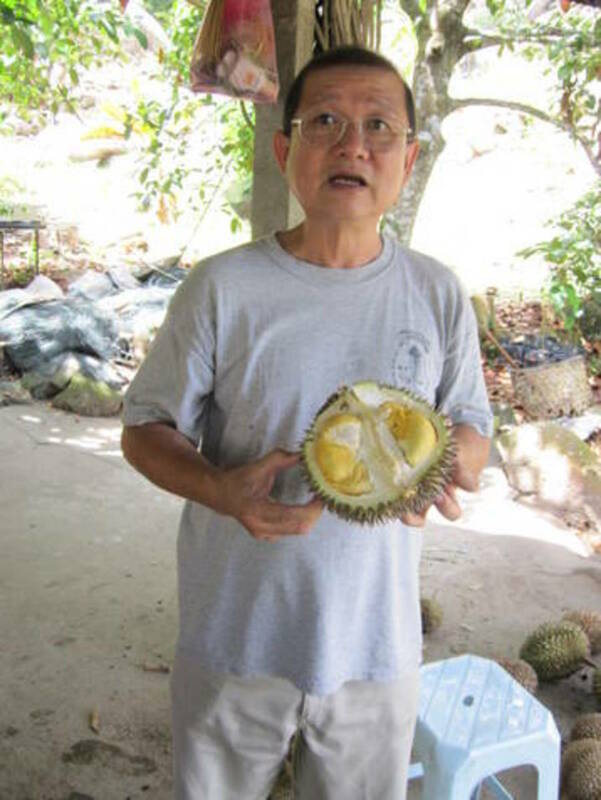 Two students from the National University of Singapore have successfully produced wine from durians. And the good news is that it has an alcohol level of only 6%; or is it bad news? 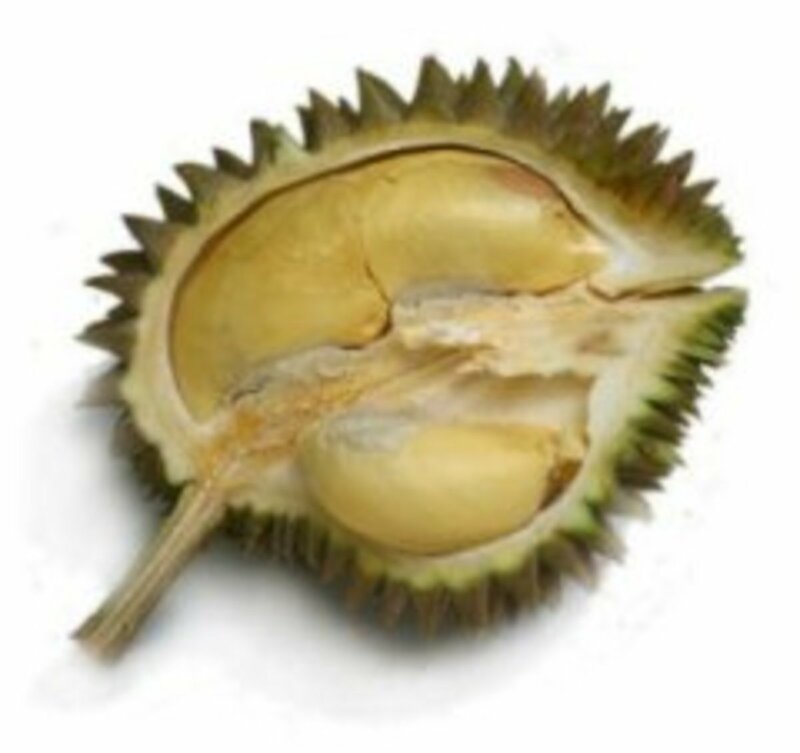 I have not seen this personally, but it has been reported that people who ate lots of durians and then drank coke had suffered cardiac arrest. This was because of the sudden surge in blood pressure due to caffeine intoxication. There is nothing to lose to avoid drinking coke or beer for 8 hours after eating lots of durians, Do it at your own risk, if you insist. For a First-Timer, Adam Is Fantastic! This is a very interesting article you wrote on "Durains" I would like to try tasting one someday. oh my God Durian, my favorite! I miss davao and Durian! My whole family like durian especially the kampung durian. We don't fancy with the hybrids. I am sorry I don't have the seeds. Good Guy, this is Fillmore, can you spare me some seeds of the true-to-type Musang King or Mao Shan Wang durian variety as a gift for me? I love to grow it here, although it will take some years for it to bear fruit it is still alright for me. Thanks a lot, advance merry Christmas to you. We have durian in the southern part of the Philippines, Davao. You can buy it cheap in that place, but once the fruit gets to Manila, you have to pay gold to have it. Some enterprising locals came up with the idea of creating ice cream out of durian and it is now selling like hotcakes at UP (University of the Philippines, Diliman) dilimall. With the scorching heat and the need to cool themselves, students are buying the ice cream like crazy. You can only get it frozen here (USA) and the quality is touch-and-go. Once I got lucky and it was very pungent and very good. 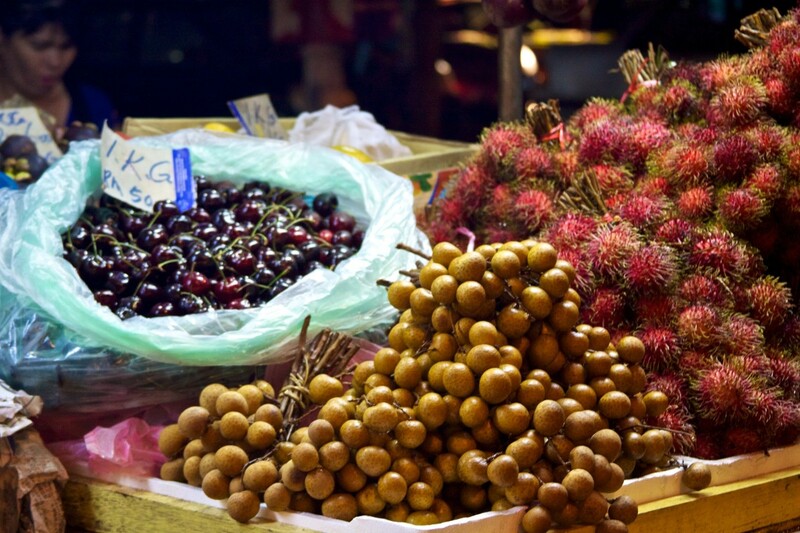 I think I would like the naturally-ripened fresh-off-the-tree Penang ones if I ever got there. Maybe someday. I always like the by-products, especially durian ice cream. You are the exception I think. Usually those who can't stand durian will not tolerate its by-products. Thanks for reading and thumbs up. A good friend,knowing my addiction to Durian,brought a fresh one for me from Thailand. Thanks to his "smell" and bad reputation here in Rome I was dispensed of sharing it with my disgusted friends and had it all for myself. How wonderful...what a treat!! I love to eat durian, I wish the Musang King or Rajah Kunyit will soon be available in the market here in Zamboanga del Norte, particularly in Dipolog City and Sindangan. I am thankful for the information you post about the king of fruits. I'm not Asian but I'm hooked. I buy a Durian every week now. Quite the expensive habbit. Durian is so peculiar that I am always afraid of eating it.But I think it will be intereting to do that. This is great ,yea i do believe smells like hell BUT taste like heaven... Love Durian so much ! I've never known quite what to do with a durian. Next time I will definitely be buying one to try. This is a great hub! I wouldn't mind hiking up that hill if it means I could get a few durian. Yum! 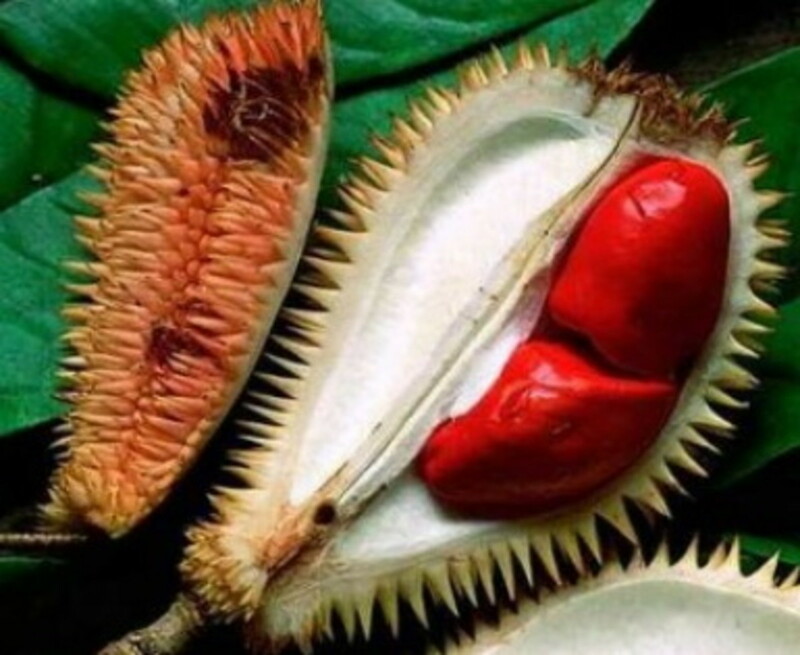 I didn't know there is such thing as a red durian. Amazing! Wow! Thanks for very good coverage on durians! I just tookover (about a year now) a durian orchard in Jelebu District in Negeri Sembilan. It is very tough to identify each and every durian variety. Oooh...you organise Durian trips? I've been on one special one to Pahang. It was fantastic - horizontal tasting of durians where we were given instructions about the order in which we ate the different durians. LOVE LOVE LOVE Mao Sang Wong. When you are coming, please let me know and I shall arrange for that Durian trip that you will cherish all your life! Durian season in Penang is from April. Great article, Justin! Some of those varieties I've never heard. When I was in KL two years ago, I tried the Mao San Wang. I really wish I lived in durian country, so I can get to know all the different kinds. Looks like I'll have to make a pilgrimage to Penang! How I wish I was there to enjoy the durians. I love them. Great hub. Just been in KL - and there's a glut of durians on at the moment. Had magnificent Raja Kunyit, my favourite variety! Great article, Good Guy! I love durian! 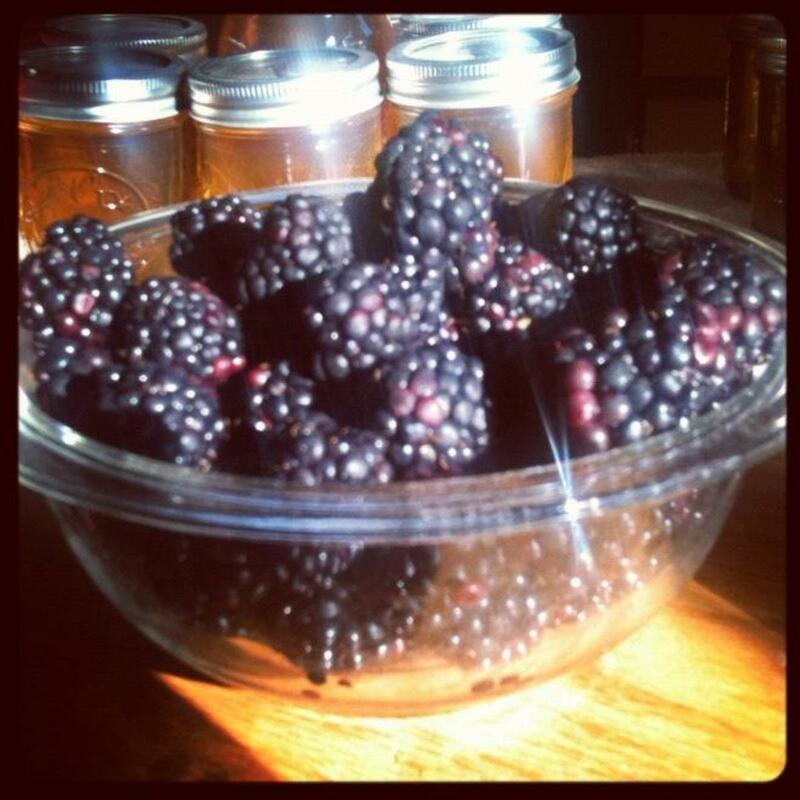 It's so great that you create a very thorough hub about this amazing fruit. Looking forward to see other hub from you, Good Guy. Thanks for the info. I don't know whether I will try it, as drinking gassy drink is not recommended after eating durians. I am glad you know now. 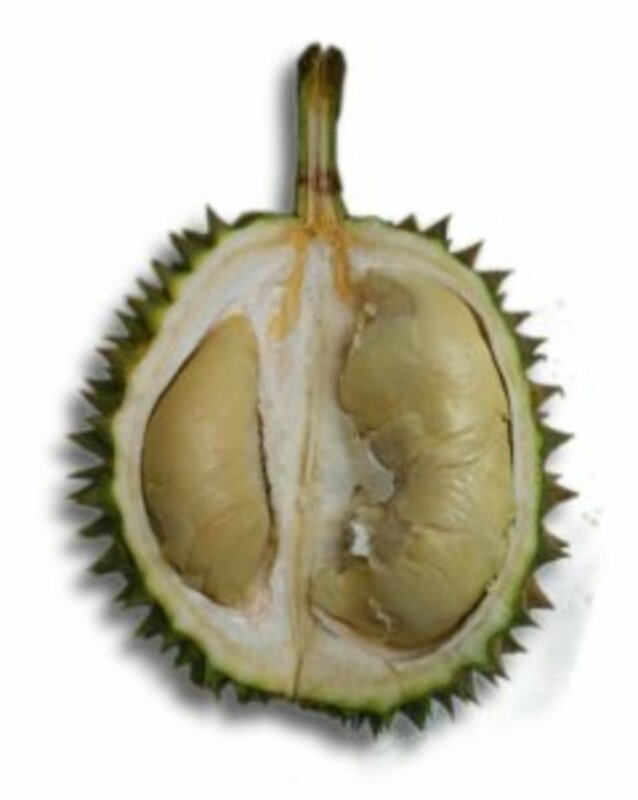 This hub caught my attention because there's a fruit in a video game called Durian and I never knew what it was. I never knew there was so much information about this fruit haha. Great hub. Just joking. My sincere apologies if anyone felt "insulted". No malice intended. I live in Davao and this is one of the symbols of our city. This is also one of my favorite fruits. Try eating one and you will certainly agree that its peculiar sweet taste is so addictive.